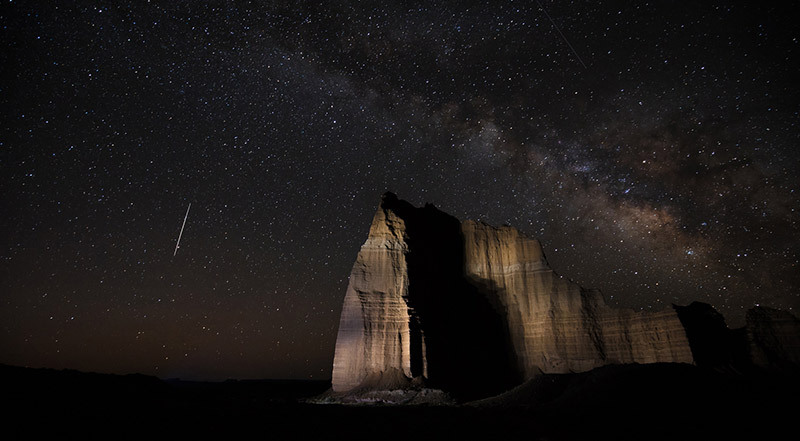 What could be better than capturing a photo with a trillion stars above one of our own planet’s epic landscapes? Astro photography can be a tricky genre to tackle, not least because it involves getting up in the middle of the night. Having just returned from one of the best astro photography locations in the world, I thought I would share a few tips and techniques for anyone wanting to give it a go. The first thing you need is a suitable subject in a suitable location. Ideally you should be looking for a subject which sticks up well above the horizon, and has a recognisable or interesting shape. You also want to be looking for something which is not too far away, but far enough so that it appears on the same focal plane as infinity - which on a wide angle lens is usually about 10 metres or more. 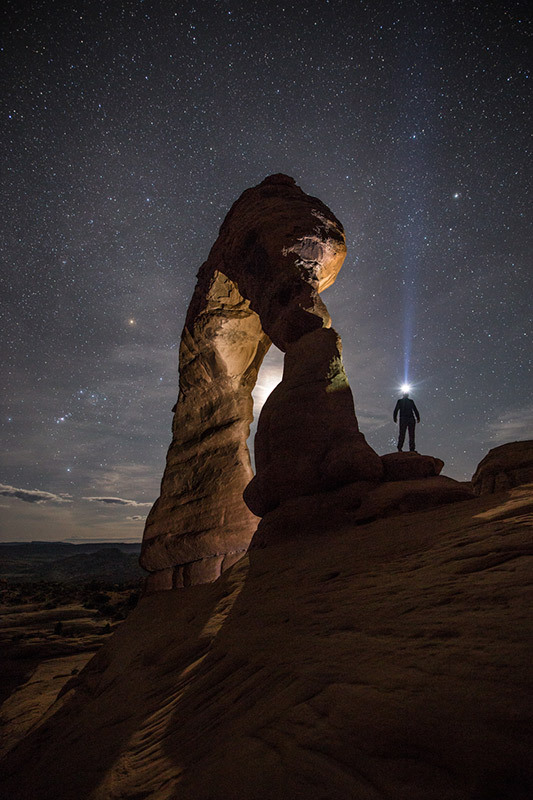 With regards to location, you want to be looking at somewhere with low or no light pollution. This means getting as far away from larger cities and towns and heading for more rural areas where the night sky can be seen in better detail. Once you have your location sorted, the next thing you need to be looking out for are the perfect conditions. Obviously you will need clear skies with little or no cloud. Look out for high pressure systems which will typically bring settled weather with clear skies. The ideal situation is for a still clear night which will allow you to stay out longer with uninterrupted views of the night sky. The Moon will also need to be a factor in your considerations, as you ideally want it out of the way. If the Moon is visible in the sky, then any shots you take will render the sky as a blue rather than a black, which won’t be as impressive to show up the finer details of the Milky Way. This means you need to avoid coinciding your session with a full Moon or the few days either side of it. A new Moon is ideal as it means it will be below the horizon during dark hours. The Moon appears like the Sun when you expose for the night sky. Two torches were used to illuminate the rocks - one on the background from the right hand side, and one for the foreground, reflected off the floor. Canon 5D II, Canon 14mm f/2.8 L II. Exposure was 15 seconds at f/4, ISO 3200. This is where most photographers get put off, as to get the best results you need to have some pretty impressive kit. 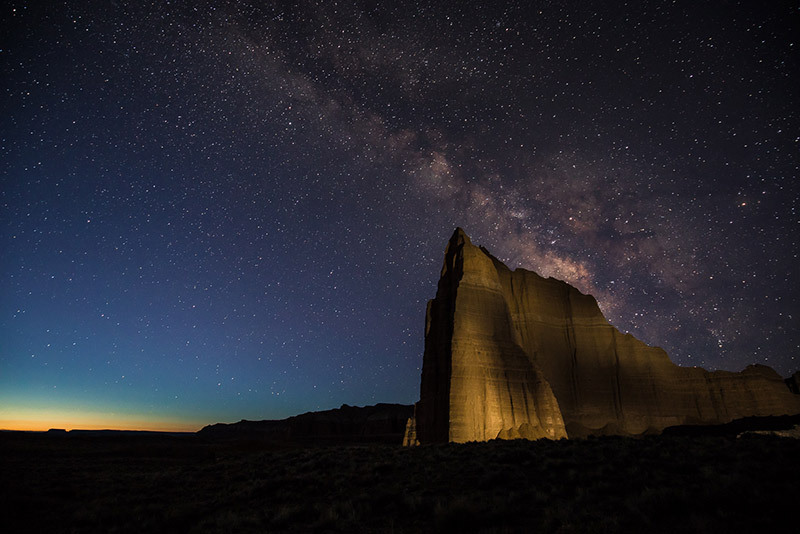 The Milky Way spans the sky from horizon to horizon, so naturally you want to shoot it with a wide angle lens which will help to include as much of it as possible. As well as the lens being wide, it also wants to be fast - meaning the largest aperture will let enough light in to allow for reasonable exposure times - more on that in a moment. Most wide angle lenses offer maximum apertures of around f/2.8 - f/4, and these are fine. However, if you have a wide angle lens which offers f/1.4 or f/1.8 then you’ll be on the right track to getting some cracking shots. The most important thing is to use your lens at its widest possible aperture. When it comes to cameras, you want to have one which gives good performance at high ISO settings. ISO controls the sensitivity of the camera’s sensor, but some cameras perform much better than others in this area. If your lens’ widest aperture is in the region of f/2.8 or f/4 then you’ll need to be shooting at ISO 3200 or higher. If however you have a f/1.4 lens then you can reduce this to around 1600 to gain better quality images. 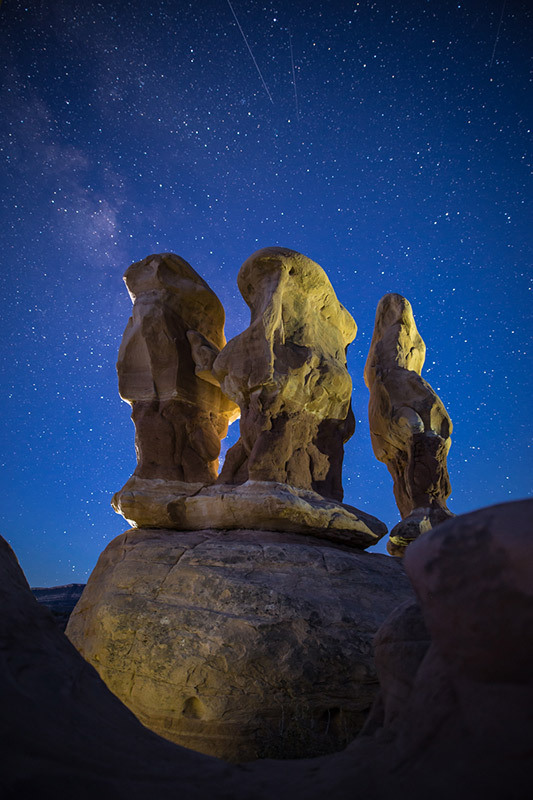 You will also need a decent tripod to hold your camera dead still during the long exposures. Avoid setting the camera up any higher than it needs to be. As you will be pointing the camera upwards towards the sky, it shouldn’t make any difference what height the tripod is at. Whatever happens, you don’t want to be using the centre column as this is basically a monopod on top of a tripod, and it’s not going to give you the best rigidity. Also make sure your tripod legs are on a solid surface. If they are on soft moss or spongey ground then the tripod is only going to be as solid as the ground it is supported by. You may not be able to see exactly what you are getting in your shot without taking a photo. 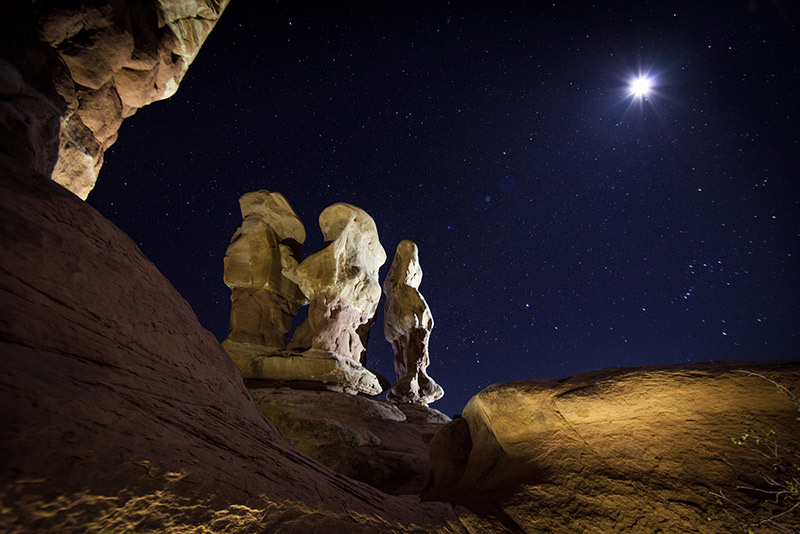 Put your camera into Manual shooting mode and select your widest aperture, ISO 3200, and a 30 second exposure. 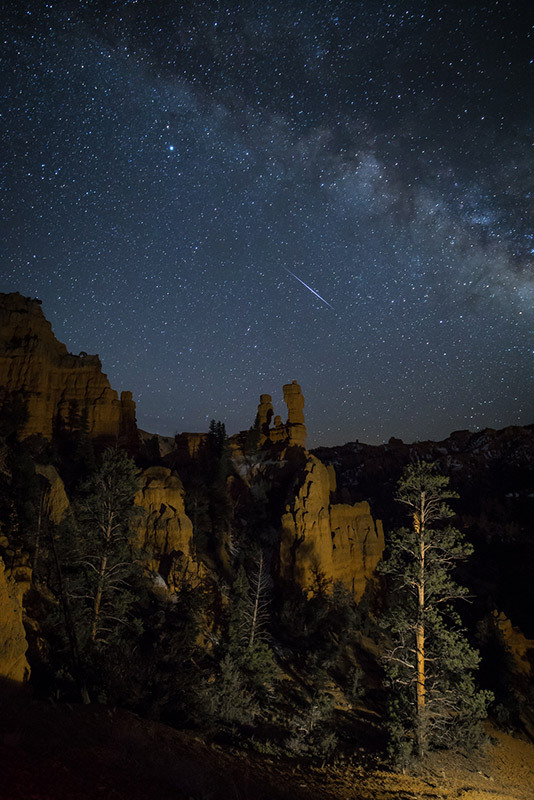 Take a shot and you will see where the Milky Way is located and how other foreground subjects are positioned. Make any adjustments necessary and repeat the process until everything is looking good. A trio of satellites got in the way of this shot. These aren’t that obvious to the naked eye but appear clear in any photo. The rocks were lit by 2 torches, although not very successfully due to the hot spots on the left hand rock. The blue sky is due to the Moon being out. Canon 6D, Sigma 20mm f/1.4. Exposure was 20 seconds and f/1.4, ISO 800. Getting your shot sharp is key to the success of your astro images, but it will be too dark for the camera to autofocus so you are going to have to do this manually. This is where it gets a little difficult as depending on the camera you have, the process will be slightly different. If you have a Canon camera then you will be in the best hands, as the focusing on the Liveview screen is the best out of all the brands. Simply choose one of the brighter stars in your frame and turn on Liveview. Using the magnifying button (not the zoom ring) make the star as large as possible on the screen. On most cameras this will be displayed as x10. With the lens switch set to manual focus, twist the focus ring until the star appears sharpest. This can be a little difficult to see, but an out of focus star appears larger than a focused star, so you are trying to make the point of light as small as possible. Once you have achieved this, press the magnifying button again to return to normal screen. With most Nikon cameras the resolution of the Liveview simply isn’t good enough to focus with, so you are going to need to adopt a trial and error approach. Put the lens and the body into manual focusing mode and visually align the focus scale on the lens to infinity. Now take a shot and view it on the screen. Zoom in to the shot to check the focus is sharp. If it is, then good news, but if it looks slightly soft then you will need to guess which way to move the focus ring. Only make tiny adjustments as you will already be in the right area. Take another image and compare it to the previous one to see if the sharpness improves or gets worse? If it improves then you are going in the right direction. If it deteriorates then go the opposite way on the focus ring. Keep repeating this exercise until the image is pin sharp. Other camera brands will all be different, but try the technique for Canon first, and if that doesn’t seem to be working then adopt the Nikon technique. Once you have focused, be mindful that some zoom lenses will alter the focal plane as their focal length is changed, so don’t adjust the zoom once you have achieved focus. If you move the camera to a new viewpoint, there is no need to refocus unless you think you may have knocked the lens barrel. Infinity is infinity, regardless of where you stand. There is no need to use any filters with astro photography. This is an example of what happens when you use a long exposure time - capturing the movement of the stars as they rotate. You want to be shooting at the highest ISO setting possible without the image quality degrading too much. This varies from camera to camera, so do some tests beforehand to check which ISO setting is the highest you can go to before noise starts becoming really obvious. Some modern cameras will allow you to go to ISO 12,800 without much image degradation, whereas others will start looking dodgy after ISO 1,600. As mentioned earlier, you want to use your lens’ widest aperture setting to let as much light into the camera as possible. When viewing the image on the camera’s screen, remember that your eyes will have now adjusted to the dark conditions, and everything will appear very bright. Use the histogram to judge exposure rather than your eyes, as your eyes will no longer be a good judge of how bright your image is. You certainly want to include some form of foreground subject, otherwise your shot of the Milky Way will be boring. You have a couple of choices here. The first is to render your subject as a silhouette. This can work if its shape is iconic or recognisable, in which case you don’t need to worry about lighting it - simply expose for the stars and all will be good. An example of what happens when you don’t illuminate the foreground. This was to determine the correct exposure for the Milky Way. Canon 5D IV, Canon 16-35mm f/4 L IS. Exposure was 30 seconds at f/4, ISO 3200. The second option is to artificially light your subject, and this can give extra impact to your shot. You won’t need a lot of power as you won’t want to over-light the foreground otherwise it will dominate the scene. Allow the Milky Way to be the star of the show (see what I did there?.. Star?.. oh nevermind)! Depending on how large your subject is and how far away it is, you can either constantly illuminate it, or paint it with light. The first is easier, but may not be practical if your torch’s beam is too narrow or too bright. Painting with light may be necessary if you need to cover a wider area than the torch’s beam naturally covers, or if the torch is too bright. Shooting before astronomical darkness can result in some funky colours in the sky. This was dark enough to show the stars in the night sky, but with enough ambient light available to show cloud detail. The rocks were lit with two torches. The lighting in this shot is one of the best I have done to date. Canon 6D, Sigma 20mm f/1.4. Exposure was 8 seconds at f/1.8, ISO 1600. Taken by team member Adam Bulley. Before we go any further, we need to understand something called the Inverse Square Law. Put basically, it states that every time you double the distance between a light source (in this case the torch) and the subject, the illumination reduces by 75%. For example, if your subject is 20 metres away and appears 2 stops too bright when lit constantly, then doubling the distance between the torch and the subject will give the perfect exposure. If you wanted to reduce the exposure by only 1 stop then you need to increase the torch-subject distance by x1.4 (the same ratio as with apertures). In this case it would be 28 metres. The Inverse Square Law is a very useful thing to understand, as it will help you control anything you light artificially. Let’s say you have 2 subjects, one which is 20 metres from the torch and another which is 40 metres from the torch. You cannot light both subjects evenly in this scenario, as the further subject will only be getting 25% of the illumination of the nearest subject. So how can you solve this issue? It’s actually very easy - you just need to increase the distance from the nearest subject so that both subjects end up a similar distance from the light source. If you were to increase the distance to the closest subject to 200m, then the furthest subject will now be 220m. As a percentage they are now only 10% different in distance, so the Inverse Square Law will have little affect and both subjects will be illuminated fairly evenly. Even if you only have one subject, then you can still use the Inverse Square Law to control the luminance of the torch - moving further away to reduce the light and moving closer to increase it. 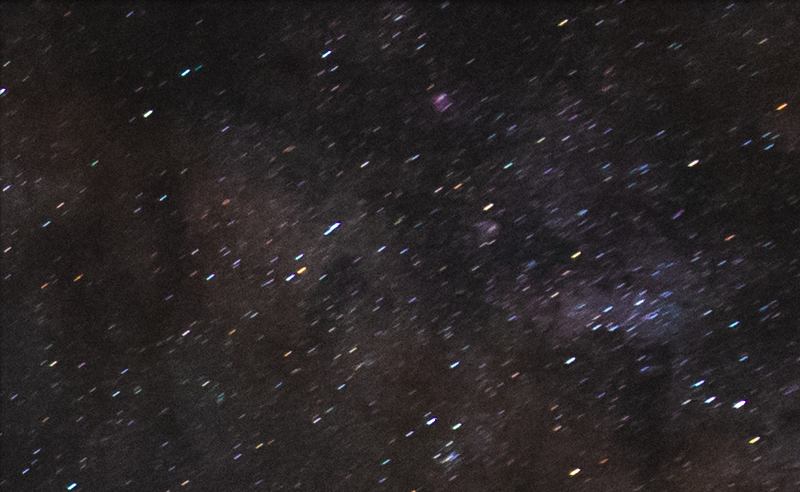 You will already have the camera’s exposure set to correctly capture the Milky Way, so you now need to adjust the torch’s exposure to meet that of the Milky Way. 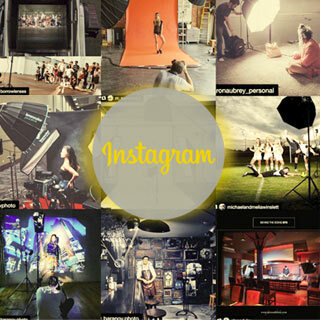 Using the Inverse Square Law is the easiest way to do this. Don’t confuse distance from the light source with distance from the camera. The latter makes no difference to the exposure. I decided to light this huge rock from the left side. To avoid too much fall off in the luminance on the right hand side of the rock, I made sure my distance to it was great enough to not allow the Inverse Square Law to start having too much of an affect. I also provided more light to the farthest area of the rock to counter the natural fall off. Each shot can be improved upon, and after looking at this one I realised that I needed to keep the light off the foreground more, and that I needed to move the torch during the exposure in order to soften the shadow on the rock. Everything else is looking good though. 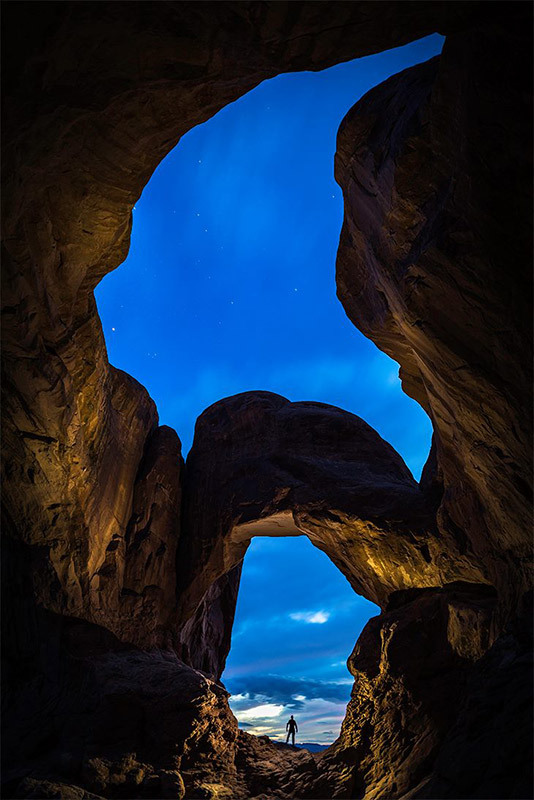 Canon 5D IV, 16-35mm f/4 L IS. Exposure was 30 seconds, at f/4, ISO 3200. You’ve identified your subject, composed the scene perfectly, and the exposure on the Milky Way is gorgeous…. what can possibly go wrong? 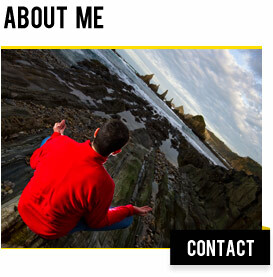 Well, the last thing you want to do is now light your foreground subject from the same angle you are shooting it from. I see this mistake occur all the time, and it will ruin any atmosphere in your photos. You ideally want to sidelight your subject, and this may mean walking some distance from the camera, so it will help if you have someone with you to operate the camera or the torch as one person cannot be in two locations at the same time. When you sidelight a subject you reveal the texture and form of it, as the shadows provide us with all the third dimensional information which would be lacking if the subject was front lit or back lit. Try to illuminate the subject from a position outside the frame, or at least hidden from view, otherwise the torch will be seen in the shot. Also try to keep the light away from he floor, as the floor will be much closer to the torch and as we have just discussed, will be getting many more times the illumination than more distant subjects, so will appear as an unsightly hot spot in the image. You may want to move the position of the torch during the exposure, as this will soften any shadows and make them more appealing. If you are a long way from your subject then this may mean running over a long distance during the exposure. If you are within a few metres of your subject then just a step or two will do the job. By moving the torch during the exposure I managed to soften the shadows on the rock. This involved running around 50 metres over uneven ground in total darkness - which was fun to say the least. I was out of sight of the camera behind a small hill in the foreground which helped eliminate the torch from the frame. By luck, a shooting star appeared in the perfect position. I couldn’t have placed it better if I had done it in Photoshop! Notice the satellite near the top right hand corner. Canon 5D IV, 16-35mm f/4 L IS. Exposure was 30 seconds, at f/4, ISO 3200. If you are lucky you might get a shooting star in your image during one of your exposures. If this happens then hopefully you will be as lucky as I was with its positioning. Watch out for other flying objects such as satellites and aircraft - neither of which you really want in your shot. Satellites aren’t usually a problem in the middle of the night, but if you are shooting within an hour or two of sunrise or sunset then they can be very noticeable as they reflect the Sun from below the horizon. A forest scene lit by two torches - both off the the right hand side. Notice the light fall off on the left hand side due to the Inverse Square Law. I had positioned the torches a long way off to the right to reduce this as much as possible. Another shooting star in the perfect position! Canon 5D IV, 16-35mm f/4 L IS. Exposure was 30 seconds, at f/4, ISO 3200. 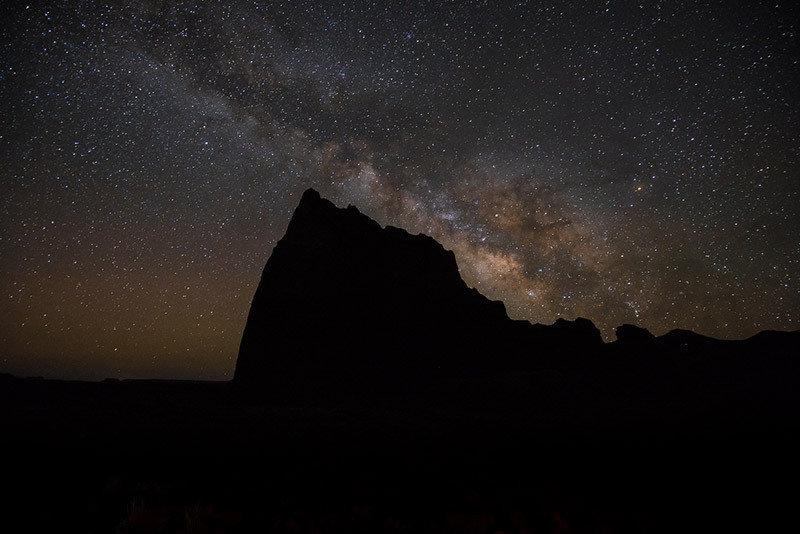 In order to capture the Milky Way you need to shoot in Astronomical Darkness which differs depending on where you are in the world and what time of year it is. If you are on or relatively near to the equator then Astronomical Darkness will start around 30 minutes after sunset and last until around 30 minutes before sunrise, as the Sun sets and rises at around 90 degrees to the horizon, meaning it falls below the horizon at a fast rate. If you are at a high or low latitude (such as here in Scotland) then Astronomical Darkness may not start until 2 hours after dark and will stop 2 hours before dawn as the Sun sets at a sloping angle, meaning it takes longer to get to a position well below the horizon. Between May - Aug Astronomical Darkness won’t happen at all, as the Sun never gets low enough below the horizon to allow for total darkness. So there is no point in coming to Scotland in the summer months to do astro photography. 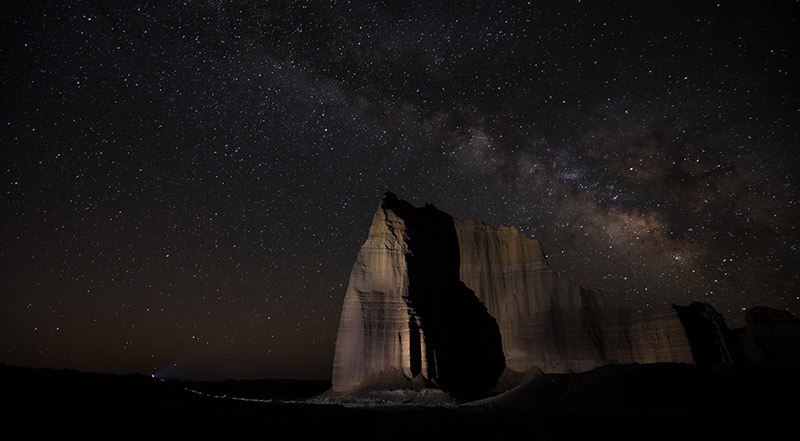 If you want to make your Milky Way images really impressive, then you will want to include the galactic core. This is only visible from certain locations on the planet and these change depending on the time of year and day (or in this case night). There are many apps to download which will assist with knowing where this will be positioned at any given location at any time of day. The lower you are in the world the higher the galactic core will appear in the night sky. So Scotland is not good for this. Dawn approaching from the east. To the naked eye this is still total darkness, but the camera picks up the faintest light from the distance. Another 10 minutes later and the Milky Way was no longer visible. Canon 5D IV, 16-35mm f/4 L IS. Exposure was 30 seconds, at f/4, ISO 3200. Marcus McAdam has been a professional photographer for the past twelve years. He started his career after winning the Practical Photography Photographer of the Year Award, and since then hasn’t looked back. He’s travelled to over fifty countries on photographic assignments for the likes of Microsoft, Panasonic and Caffe Nero. Marcus also works with companies such as English Heritage and Visit Britain, who recognise his talents as one of the UK’s top landscape photographers.